Quilted Phoenix, measures 8" x 13.5"
Final phoenix drawing and how I drew it on my fabric before quilting. 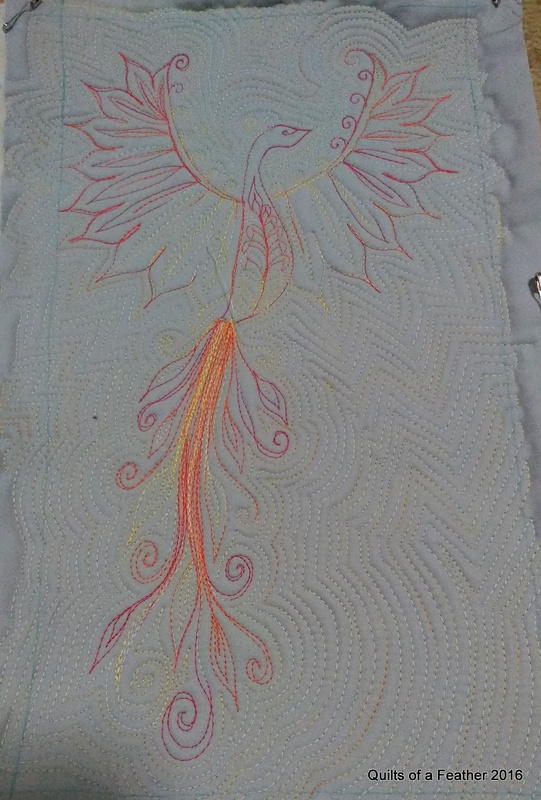 After I added the echo quilting. Now I felt like all the yellow areas of the phoenix disappeared. This little quilt was made for an old friend that is going through a lot of changes. I know the phoenix is an important image to her and kept thinking of mini quilts to make for her. This idea really inspired me though. 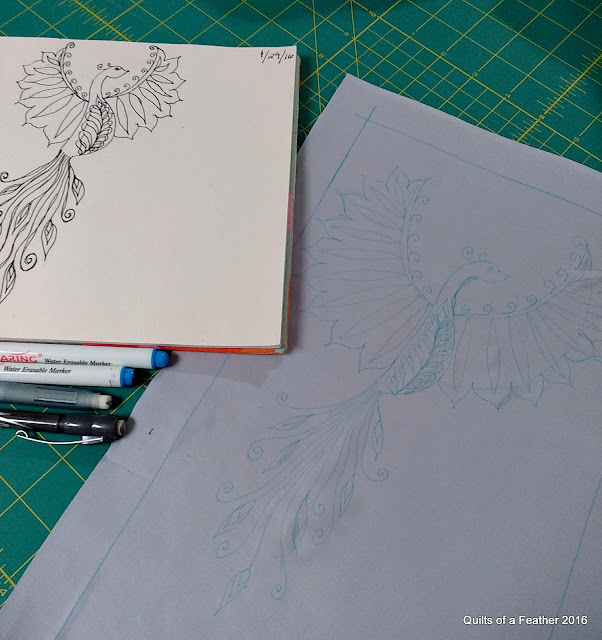 I'm thinking this has started a whole quilted mythological creature series and am already planning my next animal to recreate with thread! I think that choosing to go over the Phoenix more times was perfect; it just seems to glow! Oh Girl. You got SKILLZ!!!! Dude. You never cease to amaze! This is brilliant. How does your needle hold up to going over the sections with denser quilting? Absolutely beautiful. The back is just as striking as the front. Wow, i have a thread project this week but now I think I should try something like this...never be this good but I want to try. This is amazing - love the effect you have got with the thread. I hope your friend loves it! Lovely job! Way to go! Simply amazing! Your quilting, as always, is perfect! Gorgeous! The binding really helps highlight the work, too. It is simply amazing. And beautiful - I even like the drawing! Wonderful job. I love it. Beautiful colors. You made the right choices. Love to come back to see more. Renee, this is awesome!! That tail!! The echos, it is a wonderful beautifully threaded depiction of a Phoenix. I can't wait to see what else you come up with in your mythological creatures series! It's gorgeous! 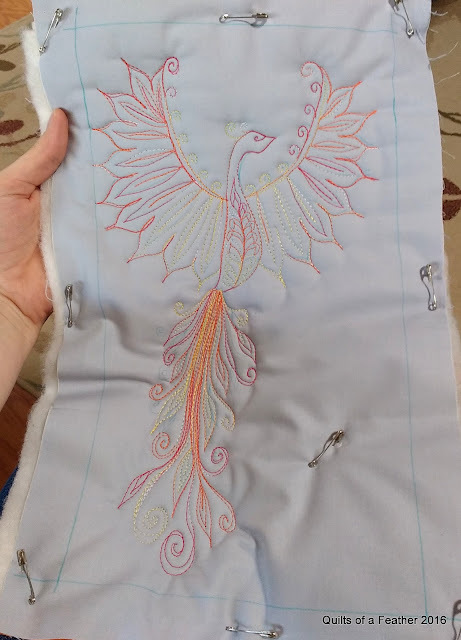 Layering the thread for the phoenix was definitely the right thing to do. It stands out so much more now. I love the effect of the echo quilting in the background too. What a great gift for someone needing a bit of a pick-me-up :) I can't wait to see what you make next. Wow! Those Aurifil names just roll off the tongue, don't they? I love the layers. Dying to knoe what's next: troll, sasquatch, unicorn, sea serpent...? You have captured a sense of flames, so appropriate for a phoenix. I have been procrastinating going over my tattoo mini again to add more colour and definition out of nerves. I can see that I will just have to do it! Wow! This is gorgeous. The echo quilting was perfect for this design and looks amazing on its own. It's awesome! Beautiful colors and design! Wow. I just had the best time browsing back through all your mythical creatures quilts. I particularly love your thread choices and the excellent pairings of binding fabrics with them. Super neat series - thanks for sharing them!